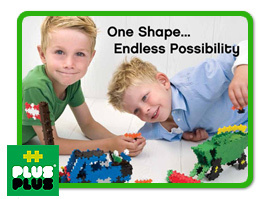 With Plus Plus, the only tool you’ll need is your child’s imagination! This simple shape adds up to endless possibilities! It develops imagination and creativity and appeals to both girls and boys alike. Plus Plus adds up to hours or fun and will quickly become a favorite toy! Be sure to take a look at the Plus plus video below!